I’ve been a regular passenger on the Derby to Crewe line for the last ten years and it was initially something of a lovely novelty to pass through the stations and see some of the old haunts of my childhood and teenage years such as Stoke, Longport (or, rather more accurately, just up the road in Burslem) and also Kidsgrove. Since 2012 however, I’ve had the immense privilege to conduct a series of interviews with the cast and crew of two television shows which has led to other writing opportunities that I could never have imagined possible when I first stepped on board. The daily commute has become valuable reading and research time and the approximate forty-minute journey each way a means of doing some work that I’d otherwise have to do at home. In point of fact, so committed am I to my research that my head is frequently found stuck in the pages of books, scripts or various old periodicals connected to Victorian or sixties era policemen that I often neglect to even look out of the window anymore. Indeed, both the settings of Whitechapel and Oxford have almost become second homes to me but I wonder if, in researching and writing about these places and the characters that inhabit them in such painstaking and intense detail, I’ve somewhat neglected to acknowledge and appreciate the historical and cultural heritage right here on my own doorstep of the Potteries. 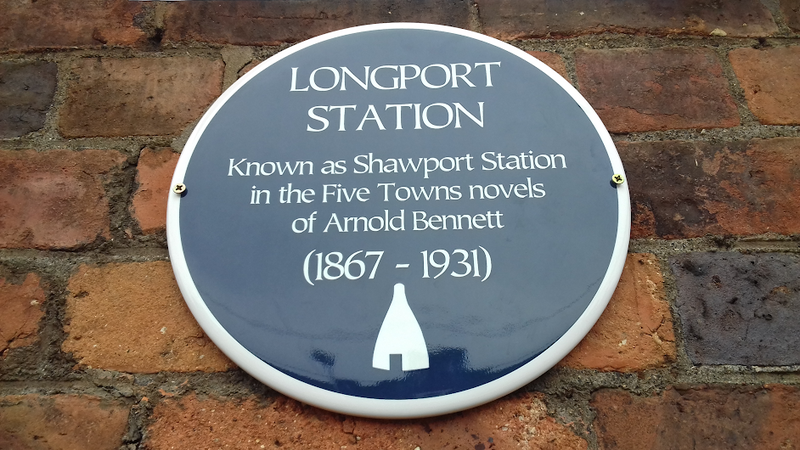 And so, when I first heard that a blue plaque was to be unveiled at Longport train station to commemorate its inclusion in the novels of Stoke-on-Trent’s most famous literary son, Arnold Bennett, I saw it as a timely opportunity to make amends. The Five Towns to which Dame Margaret refers are comprised of Tunstall, Burslem, Hanley, Stoke and Longton (Stoke-on-Trent is actually made up of six towns but Bennett somewhat controversially left out Fenton) and renamed them Turnhill, Bursley, Hanbridge, Knype and Longshaw respectively, featuring in a number of his novels including Anna of the Five Towns (1902), The Old Wives’ Tale (1908), Clayhanger (1910) and The Card (1911). These, and many of his other novels were enormously popular during the period in which they were published, and yet, for an author who was one of the leading English novelists of his day and almost as big as Dickens at one point, I wanted to learn why, in comparison to his contemporaries, his work remains largely forgotten. Indeed, ask the average person on the street if they are familiar with the writings of Arnold Bennett and I suspect they might, at best, suggest you mean Alan Bennett. 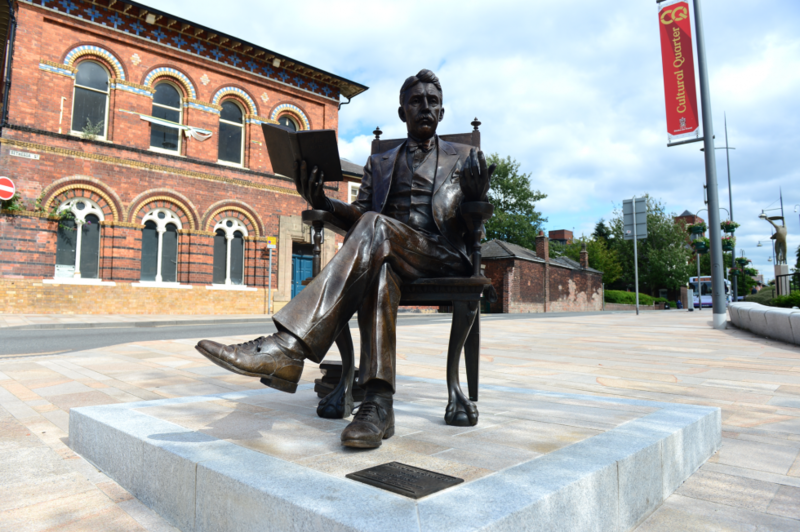 To get a better understanding of Bennett and his neglected literary legacy, I interviewed Dr Catherine Burgass, a lecturer in English and an Honorary Research Fellow with a specialism in local literature and culture of Stoke and Staffordshire. Initially interested in regional writing as a category and in Bennett as the foremost writer from the Potteries, she runs the course ‘Pits, Pots and Poets: English regional writing from 1900 to the present’ at Staffordshire University. 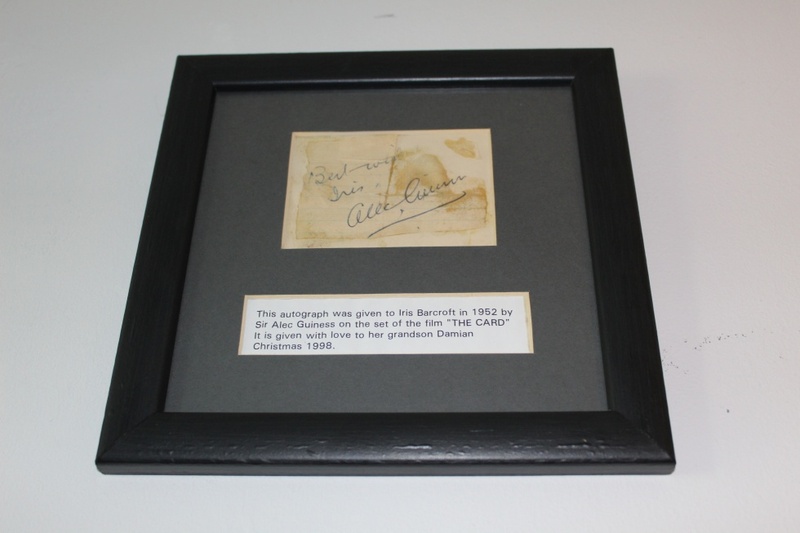 Additionally, last year Catherine was asked to choose items from the Arnold Bennett Archive at the university for an exhibition to mark 150 years since his birth. Her selection was designed to reflect Bennett’s diverse interests along with various aspects of his personal and professional life which included letters to his family, his school record book, reviews, poems, obituaries and even his introduction to one of Marie Stopes’ books on contraception! 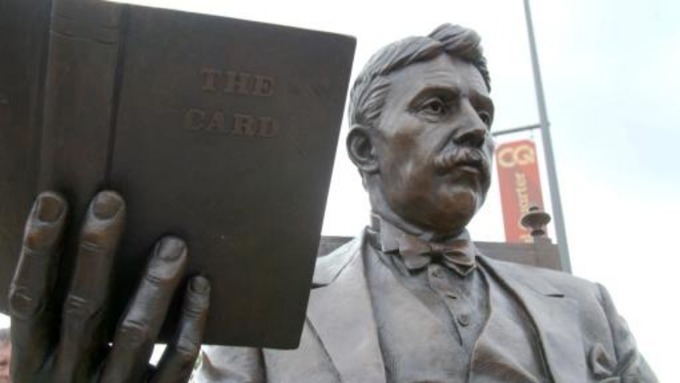 DAMIAN: Why does Arnold Bennett remain so neglected today? CATHERINE: One issue which affects Bennett’s reputation and readership is categorisation – he doesn’t fit neatly on a Victorian or Modernist course and consequently is little studied in schools and universities. He kept one foot in the Victorian past and was never part of the literary avant garde. He never subscribed to the starving artist ideal, and always balanced serious literary work with a more commercial output – something else which has not worked in his favour, reputation-wise. DAMIAN: To what extent was there a certain intellectual snobbery regarding the fact that Bennett was born and bred in an area typically perceived as lower class and known for its economic deprivation in him not receiving more acceptance and recognition from his literary peers? CATHERINE: The London literati were incredibly snobbish about Bennett himself while Stoke-on-Trent may as well have been Timbuktoo. T.S. Eliot described Bennett as ‘a red-faced, sprucely dressed man with an air of impertinent prosperity and the aspect of a successful wholesale grocer’. DAMIAN: And were the negative opinions of other people like Virginia Woolf and the Bloomsbury group towards Bennett’s work really that damaging to his reputation or do you think it’s possible that his writing simply fell out of fashion? CATHERINE: Virginia Woolf’s comments certainly did damage Bennett’s reputation. It is worth remembering though, that Bennett was still studied in schools and universities until the 1950s and later and Margaret Drabble has made the point that when she was at Cambridge Woolf was nowhere to be seen on the syllabus. The advent of postmodernism in the 1970s was probably the final straw but there may yet be a renaissance! DAMIAN: Is there a sense that Bennett betrayed the Potteries by choosing to live in more glamorous and romantic locations such as London and Paris? CATHERINE: At the time Bennett was writing, and even now, literary life revolved around the Capital, so Bennett’s removal in itself should not be seen as a rejection of his home town. 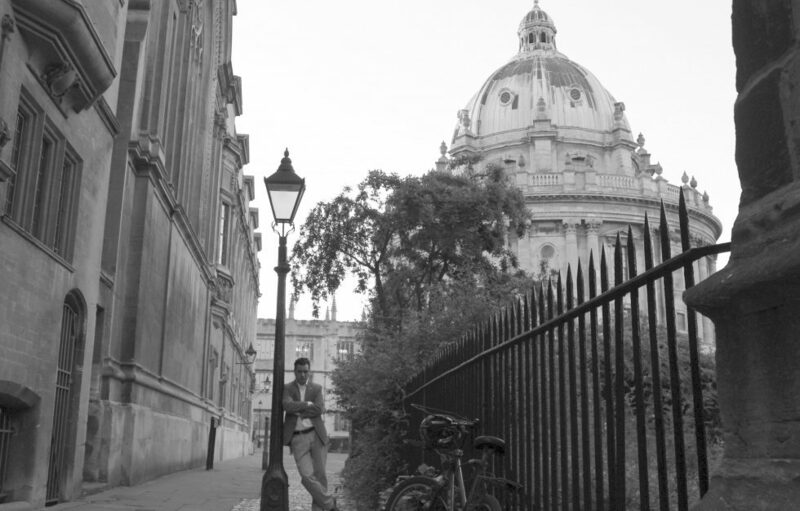 DAMIAN: But to what extent do you think Bennett wished to escape his background in Stoke and reinvent himself in London and Paris as a literary gentleman? CATHERINE: Bennett exited the Potteries as soon as he possibly could, clearly propelled by ambition. He had to earn his living – for a while as editor of Woman magazine – but clearly had designs on the literary life from early on, collecting books, seeking out like-minded companions, and so on. DAMIAN: Do you think Bennett became disenchanted or perhaps lost the romance and nostalgia with which he imbued some of literary depictions of the Five Towns in later life? CATHERINE: Once he had left, Bennett’s attitude to the Potteries was always ambivalent – he defended it frequently against the ignorance and prejudice of ‘outsiders’, but was also often critical himself. His last novel set in the Five Towns was These Twain, published in 1916, and after this he rarely visited the Potteries in person or in print. 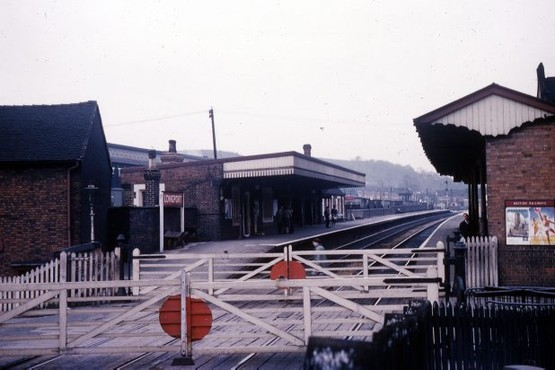 His diary entry referencing the Manchester-London train journey in 1927 – “The sight of this district gave me a shudder” – suggests an almost oedipal connection and revulsion to his place of origin. 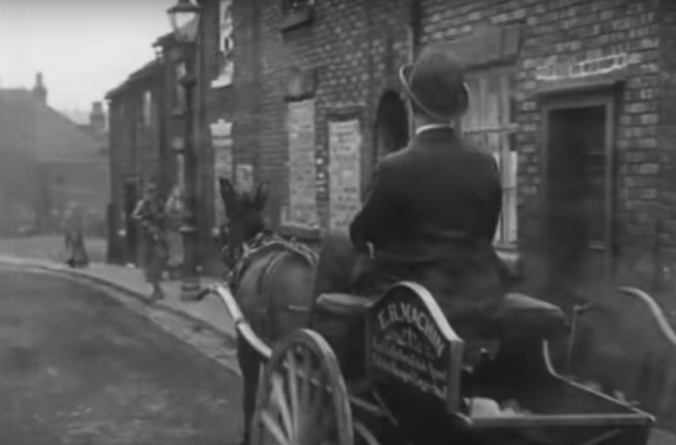 DAMIAN: As social commentary or otherwise, what does the writing of Bennett tell us about his attitude to his contemporaries living in Stoke on Trent? CATHERINE: Bennett consistently described the Potteries and its people as distinct in their behaviour and attitudes from the metropolitan/South, but possessed of the same grand passions and producing drama worthy of equal attention. An often-quoted remark encapsulates his attitude: “To take the common grey things which people know and despise, and, without tampering, to disclose their essential grandeur . . . is art precious and indisputable.” In terms of social class, Bennett was most comfortable with the representation of his own – middle – though he was keenly aware of the ironies and injustices of class relations. DAMIAN: And is there a contradiction between the writer and his writing regarding his attitudes to Stoke and the ordinary, daily lives he described there? CATHERINE: Though Bennett wrote of Stoke only after he had left for London, this is a common phenomenon – not only is the provincial writer required to move to further his career, the prerequisite artistic perspective is often achieved via the same means. Arguably, an artist of any calibre possesses the imagination to inhabit lives other than his own so there is no contradiction in Bennett enjoying the high life while depicting the ‘ordinary’. From Staffordshire University and Stoke-on-Trent train station just opposite, it’s just one short stop away to Longport station which, Carol Ann Gorton, Honorary Secretary of the Arnold Bennett Society, informs me features in Helen With the High Hand, Anna of the Five Towns and Clayhanger. Now this could get confusing but please bear with me. As with his renaming of the five towns, Bennett also renames Longport and refers to it as Shawport. OK? That’s simple enough so far, right? 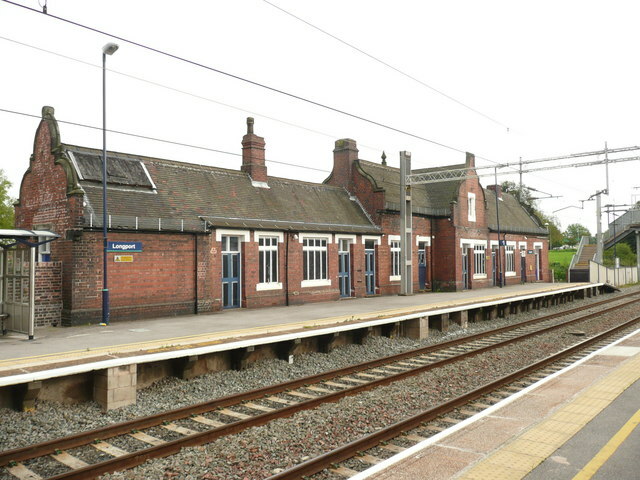 However, Longport station, which is obviously located in the Longport area, was originally actually called Burslem station when it opened in 1848 as the town of Burslem (about half a mile up the road) didn’t have a station of its own until 1873. 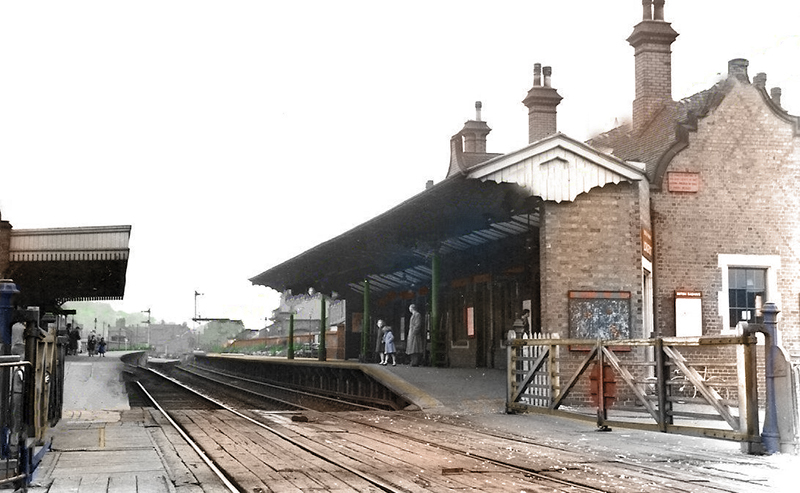 So, it was only then that Longport station became known as such. It’s a lovely little station with red brick, blue diaperwork, Tudor-style mullioned windows and Dutch gables. And, it is just me but, when viewed from the side, doesn’t the building look a little reminiscent of an old steam engine complete with chimney, cab, smoke stack and steam dome? However, since the cutbacks that were introduced by British Rail in the early nineties, the booking office, toilets and waiting rooms have all closed and the station sadly looks somewhat neglected with the windows boarded up. 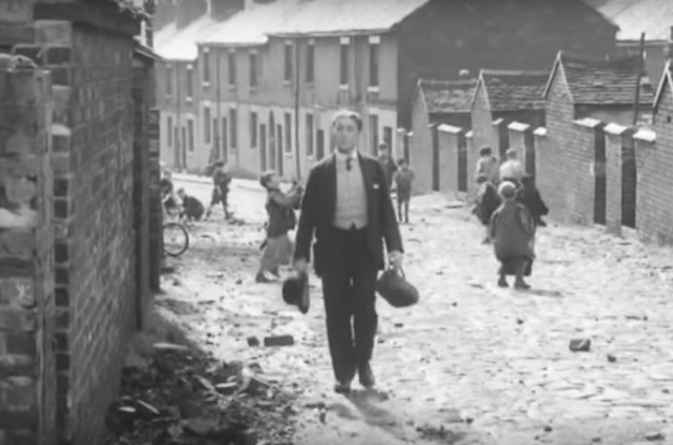 Just behind, and only a few minutes walk away, is the aforementioned Middleport with its Pottery factory; home of the world-famous Burleigh earthenware and where the BBC2 TV series The Great Pottery Throw Down was filmed before it was unfortunately axed only last month. I spoke to a lovely lady who has her own special reasons for remembering Middleport well. As a young girl, Iris Farnell first lived in Wolstanton (just over a mile away from Longport) and then Poolfields, (also in the Newcastle-under-Lyme area), where she lived with her mum and, a little later, three sisters. Her dad was away in the war and didn’t meet him until she was four. The family never had much money but her mum and dad did everything to ensure their four girls had the very best that they could afford and Iris remembers having a wonderful childhood going on family walks together and playing games on the Marsh across the road from their house. However, what they really enjoyed was putting on concerts in the back garden where they would use the washing line to hang blankets on as the curtains and invite neighbours to watch while mum provided refreshments. In those days, creating your own entertainment was almost a prerequisite in a home without any books (apart from those given to her from Sunday School) and no television set until Iris was a teenager. However, they did have a wireless and she loved to listen to the Ovaltineys and the top twenty on Radio Luxembourg which often featured her first crush, Tommy Steele. Iris also spent a lot of her childhood at her nan’s house in Stanfield where her Auntie Doris and Uncle Len also lived, and one of the reasons Iris liked to stay there so much was because they did have a television set and could watch Muffin the Mule on Sunday evenings. As Iris spent so much time at her nan’s with Auntie Doris and Uncle Len, she had a special relationship with them and they would often take her on seaside day trips to places such as Llandudno, Blackpool and Southport, often travelling by train from Longport. 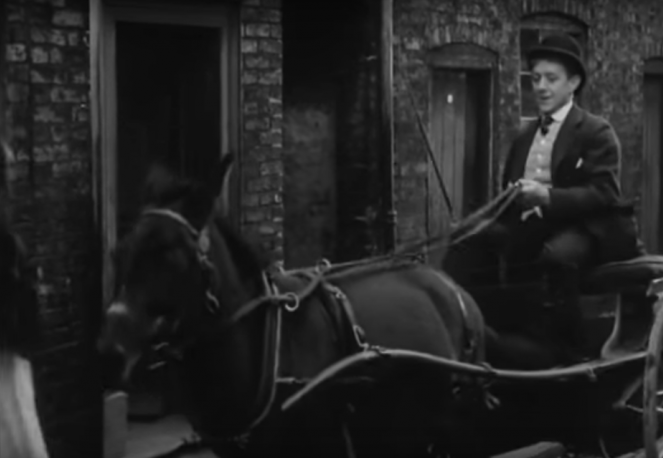 Just up the road from the station in Middleport, Auntie Doris’ brother, Uncle Charlie, lived at 42 Spencer Street. Typical of the area at the time, it was a tiny two-bedroom terraced house with a small living room and kitchen. There was no running water, only a tap outside which was shared with neighbours along with a toilet at the bottom of the yard. Gas lamps still had to be used as there was no electricity either. However, for distinguished filmmaker, Ronald Neame, who had worked on several George Formby films, Powell and Pressburger’s One of Our Aircraft Is Missing and collaborated with David Lean on some his finest early British films including This Happy Breed, Blithe Spirit, Brief Encounter, Great Expectations and Oliver Twist, Uncle Charlie’s modest little home proved to be an ideal location for a film he made in 1952 based on Arnold Bennett’s The Card and starring acting legend Alec Guinness. 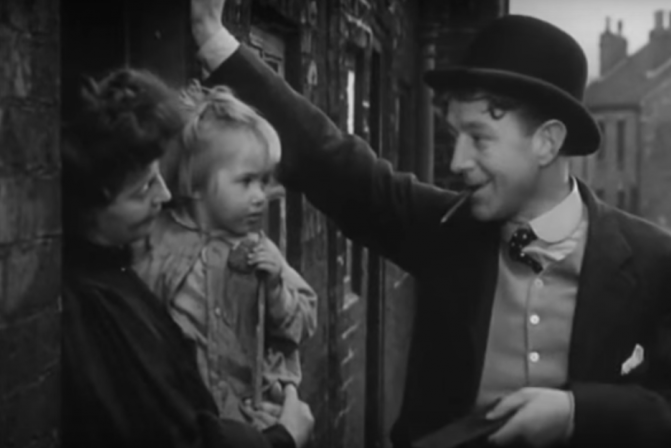 Although she was only ten at the time, Iris remembers the filming well: “Auntie Doris was very excited that the film company were using her brothers house for the film and it was her idea for us to pay Uncle Charlie a visit. I was in the living room and in walked Alec Guinness! In the film he is a rent collector and they used the house as one of the houses he collected from”. 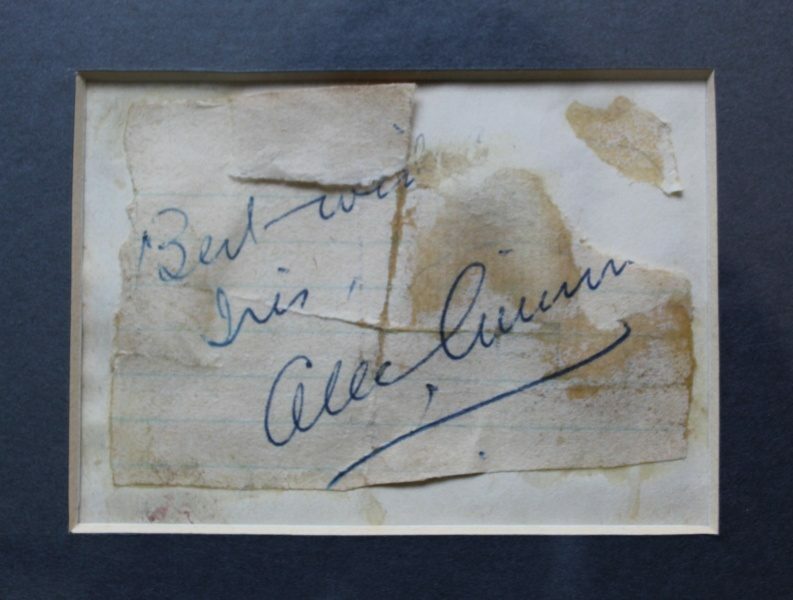 Iris kept Sir Alec Guinness’ autograph for many years until, in 1998, she had it framed and gave it to her grandson who she knew was a great admirer of the actor. It now hangs proudly on the wall of my office. 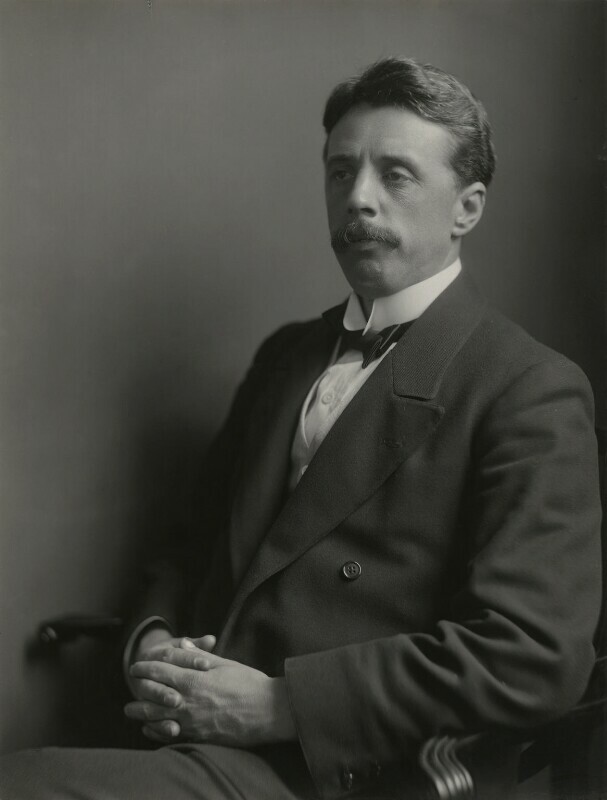 So, despite remaining somewhat neglected by the general public, Arnold Bennett and his writing still continues to touch our lives in different, and sometimes, quite personal ways. 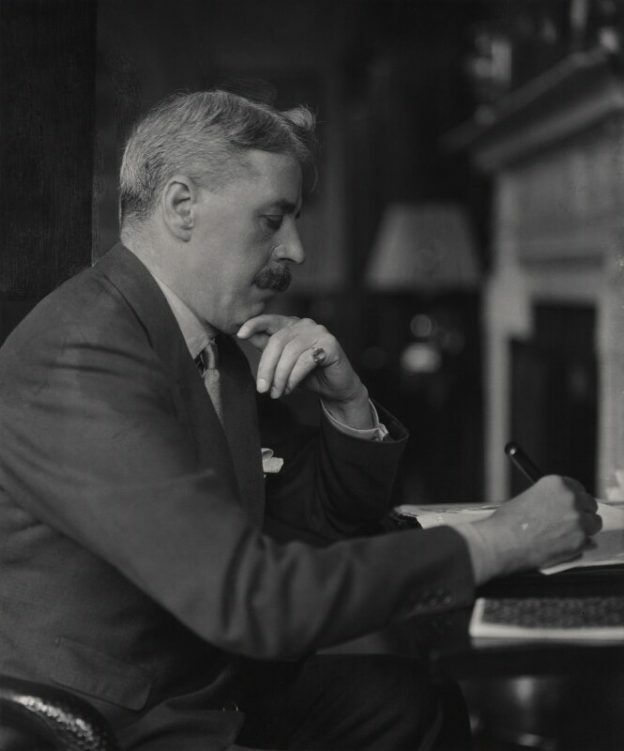 Furthermore, the Arnold Bennett Society is committed to promoting the study and appreciation of his life and work, putting on various events throughout the year while also supporting local authors. In addition to the blue plaque at Longport, the society has also previously erected one at his former home at 205 Waterloo Road, Cobridge in 2014 and both last year, another plaque at Moorland Pottery in Burslem (known as Chelsea Works in the novels) and a magnificent two metre high bronze sculpture of Bennett outside the Potteries Museum and Art Gallery. If you’re ever in the area, it would be lovely if you have a look for these yourself. And, if you’d like to learn more about Bennett, why not join the society by following the link here ? This entry was posted in News and tagged Alec Guinness Middleport, Alec Guinness The Card, Arnold Bennett, Longport, Longport Arnold Bennett Blue Plaque, Longport Train Station, Shawport, Shawport Train Station, The Arnold Bennett Society, The Card 1952, The Card Middleport on August 12, 2018 by Damian Michael Barcroft. Thank you Damian for an excellent article. Lovely to meet Iris.